Pursuing the American Jewish Dream in Miami and L.A.
 A lucid account of American Jewry's second great migration- -from the old, cold cities of the Northeast and Midwest to the sunny new Edens of Los Angeles and Miami. According to Moore (American Culture/Vassar), just as Jews from Warsaw and Cracow made a new start in the New World, the post- G.I. Bill migrants to Miami were ready to make a break from the crowded ``Old Country'' centers in places like the Bronx or to follow the Dodgers from Brooklyn to Los Angeles. Moore sees Miami as the principal ``suburb of New York'' and traces the move from specific Midwest neighborhoods to the ``Kosher Canyon'' of LA's Beverly-Fairfax area. 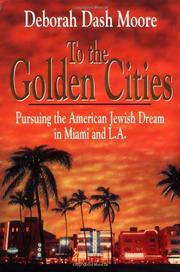 Aware of their similarities, Moore is careful to delineate the demographic, sociological, and religious factors that made Jewish Miami and L.A. distinct. Miami, termed ``God's waiting room'' for its large number of retirees, saw a denser, more ethnocentric community form in ghettolike strips of Miami Beach, where old hotels became retirement homes and estates turned into high-rises. While the mellower, more suburban West Coast scene faced no Klan bombings, Jewish Angelenos encountered exclusivist WASPS, with many Jewish Hollywood writers and producers hurt by ``anti-Communist'' blacklisting. Both communities have been galvanized by the rise of Israel (aided by Hollywood's Exodus film) to the extent that Moore sees the Jewish state replacing New York as their cultural center. The study credits these suntanned American Jews with recasting the well-defined traditional Jewish religious and ethnic culture into ``symbolic cultural fragments...that are more individualistic and voluntary.'' Sadly, this lively book does not take us up to the 1980's, but Moore is a historian, not a journalist, and her story gives modern continuity to the Diaspora.